These 2013s are going to be great race cars, eventually. But why behind schedule? 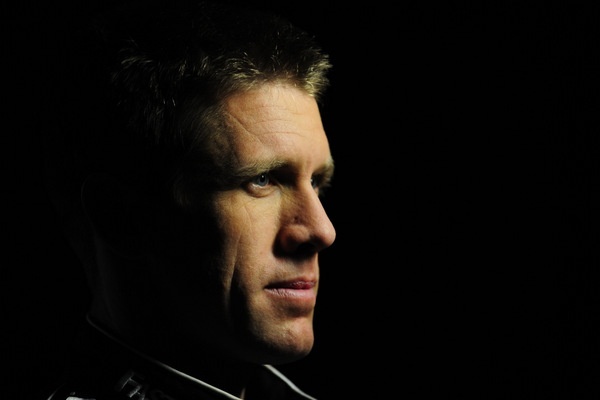 When it comes to pumping iron in the gym, working out on Nautilus machines, pounding out miles on treadmills, and eating ALL the right foods and power supplements, probably no one in the NASCAR world does it better than Mark Martin and Carl Edwards. Once teammates, lately rivals, the two are legend for their workouts in the gym and for their tough racing on the track. Last year was another great one for the ageless Martin, who just turned 54. He was part of the surprising resurgence at Michael Waltrip's. After such a brilliant 2011, what the heck happened in 2012? That's the Carl Edwards' question. The enigma. Man, when was the last time this dude gave us one of the famous victory back-flips? Edwards, under virtually every other scenario except the one that actually played out, would have won the NASCAR championship in 2011, with a great 10 month run, right down to the final miles at Homestead. He tied -- tied -- Tony Stewart in points, but lost the title on wins. Even considering the sport's frequent 'next season' malaise after such title runs, Edwards' 2012 season was, well, a question week after week. And it was put in especially stark light by his teammates' strong title bids last year; Matt Kenseth and Greg Biffle were atop the Sprint Cup standings for 21 weeks. "It's way easier to win," Edwards says with a wry grin, comparing his good years to the last one. "It's a lot more fun. "I didn't realize the difference. "It's a lot more fun to win." 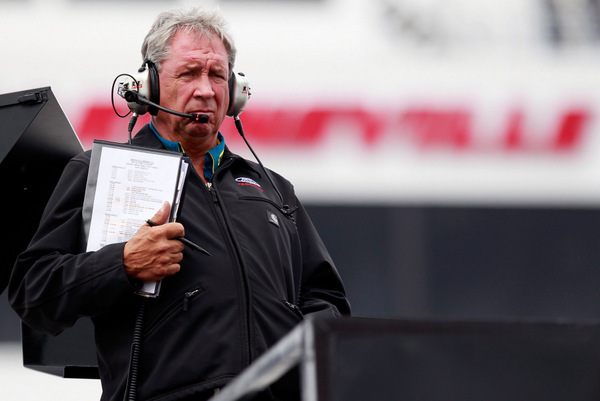 So will new crew chief Jimmy Fennig have the magic touch to get this part of Ford's NASCAR operation turned around? Fennig, who turns 60 this year, has been on the road for a long, long time, and NASCAR roadwork can be crushing. Even Robbie Reiser, 10 years younger, got off the road a few years back and seems to be enjoying this sport a lot more as competition boss back in the shop, instead of chasing his tail between nameless motels and the endless run of race tracks. Edwards better make it worthwhile. Okay, let's ask Cousin Carl, again, about 2012, and see if there are any solid answers yet. But then maybe it doesn't matter. That's history. The story now is new crew chief Jimmy Fennig and the new guys on the team, and how well Edwards will fit into the new mix. While the last few tests of the new 2013s may not have shown much in terms of chassis dynamics and aerodynamic efficiencies, Edwards says "I got to know my tire guy, and he kind of understood what I wanted to know...and the shock guy, and the engineers. New people you have to take time to understand what they want. And I've been working hard at that." And of course Fennig too. But then Edwards laughs, because Fennig is notoriously difficult to read. The quietest guy in the sport? "I don't know him well enough to tell you the intricacies of Jimmy's personality," Edwards says. "But for me, from the outside, he has a very good perspective." That is, basically, "work hard." "It's not something he yells at people about. At least he hasn't yelled at me. But it (hard work) is just expected. "And the feeling I get from Jimmy is that he holds everyone to a high standard. And that's good. "Just the little bit of time we've spent at the track, it's not a joke, it's not a social event, we're there to do a job." "But he's not against innovation," Edwards says with a grin. "I've seen some things on the car that are pretty amazing. "He's just so quiet, and you've seen that too...and in the past maybe I confused that with being not engaged. But he is as firmly rooted in what's going on as anyone I've been around. "At first I was thinking 'Good...he runs good with Matt, he's an icon in the sport, he's had success with all these drivers.' Now the more I know about him the more excited I get, because I see how good he is with the people, how engaged he is with the cars. "I just know Jimmy a little bit; we'll be a lot closer after a few weeks. "Now I don't want to sit here and forecast all these great things, but I have a very good feeling about the season. I think it is going to be very good." 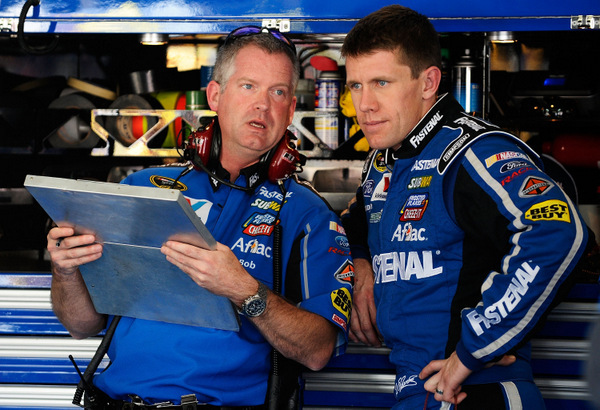 Still, Edwards' success with Bob Osborne at crew chief for so many years may be hard for anyone to match. The two had a seamless relationship. And when Osborne became ill sometime last season, things got off-kilter. Roush says he thinks Osborne may have been a bit distracted by his medical problems (still not revealed, but apparently now under control). A few years back Roush split up Osborne and Edwards, to disastrous result. "Bob's good now; he'll be at the track," Edwards says. But aren't Osborne and Fennig two different types of crew chiefs? "I can't quite figure out how Bob and Jimmy are different," Edwards says. "They're alike in a lot of ways, but they're different too. "I've talked with Bob about Jimmy; he's known Jimmy for a long time. "I don't quite know Jimmy's quirks yet. I can't quite tell when Jimmy is joking and when he's not. "I also don't know what Jimmy finds humorous. I send him a text some times and he doesn't respond, and I'm thinking 'Maybe he doesn't think that's funny.'" Of course perhaps the same could be said about Osborne. Crew chiefs in general are so intense that humor sometimes seems too rare a commodity up in the haulers. But then maybe Edwards can supply some of that. Last season certainly wasn't awash in humor in the Edwards camp, and that's quite uncharacteristic. The year wasn't so much any great collapse for Edwards as much as it was that he never really seemed to get out of the blocks. The most troubling part of it, he says, were the issues at the tour's mid-sized, intermediate tracks, like Las Vegas, Texas, Charlotte. "The fall in performance at those tracks last year was actually a little bit scary," Edwards says. "From my very first race, I've always been super-confident at those tracks...and that's why this Charlotte test (two weeks ago) was so important for us. We needed to make sure there wasn't something we were missing. "And we were so fast at Charlotte that we should have a lot of confidence. "That test was a big moment for me; I thought about it all winter, and those tracks are the bread and butter. 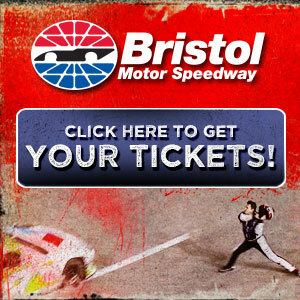 You can make a championship run with good runs just at those tracks." Indeed, five of the 10 playoff races are at such mid-sized tracks: Chicago, Kansas, Charlotte, Texas and Homestead-Miami. Of course maybe it's not Edwards and crew but the cars themselves. 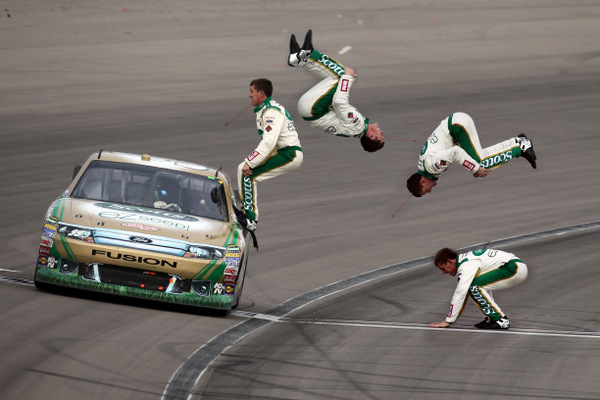 A driver and team can't carry a car on their backs on Sundays. And the car-of-tomorrow was notoriously fickle; last season's chassis trick-of-the-year was that whateveritwas under the rear ends that the Hendrick teams finally made work by mid-season, and that rivals chased the rest of the year. "The way the sport is right now is that you build the car and set up the car to what the (computer) simulation says is best. Then you get in the car and tweak it from there. "At the track when Greg and Matt and I would arrive with the same thing, we'd all have the same comments. It wasn't like one of us needed one thing and another one needed another." The Hendrick tricks last season? Roush says that stuff certainly "upset the apple cart" for rivals, sending some down the wrong roads. "The things people were working on last season was a real state of change," Edwards says. "A lot of people figured things out....and some people didn't. "I'm not making excuses, but as a whole, our group was behind. "Matt and Jimmy did make some things work. They had some great races at the 1-1/2-mile tracks...while we really struggled. And I still don't know if I exactly understand what the differences were there." Not sure if much of that was very enlightening.....but it does appear things are hopeful in the Edwards-Fennig-Roush camp. Can Edwards give us a workout to live by? "But from the standpoint of my life, it's been rewarding. I work with Carmichael Training systems, and my trainer spends a lot of time with me discussing the strategy for the season, so you're in the best shape you can be at the end of the season. "Ten years ago I laughed at people who worked out; I thought it was a joke. Now it's a huge part of my life...and some time I can invest in myself alone. "But I don't discuss the details. I just eat right and work out, and we have a good system. "Six or eight years ago when I started running the Cup series, I'd go to the gym at the track and there'd be maybe one other guy in there. Now everybody is working out. So to stay at the edge of that you've got to keep moving forward...and I've quit sharing the details of what I do."